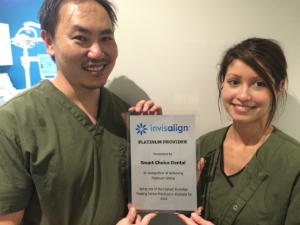 Smart Choice Dental has just been recognised as one of the leading providers of Invisalign clear braces in Australia. Being one of only a handful of Invisalign practices in the western suburbs of Melbourne to receive this prestigious honour, it further cements Smart Choice Dental as the natural choice of practices to look after your dental needs, and Invisalign clear braces. Dr Ben Scully – one of 3 practitioners at Smart Choice Dental who assists our patients with Invisalign. And the great news is that no matter what health fund you are with, Smart Choice Dental helps you with the paperwork to make sure you can claim back from your fund. The combination of our competitive pricing, expert knowledge, payment plans and health fund options, will truly help you smile all the way with your Invisalign treatment. Smart Choice Dental offers a complimentary consultation with one of our dentists to discuss if Invisalign is right for you. Call us today on (03) 9317 3144 to arrange a consultation, or visit our contact us page.